On a recent road trip, my car-mates and I decided to listen to two novellas from James Patterson’s Bookshots output during the journey. My only other experience with Bookshots was reading and reviewing The Witnesses, written in collaboration with Brendan Dubois. Just as with that time, these current choices were rooted in my interest in the collaborator – not so much James Patterson or the publishing experiment itself. I will read anything Duane Swierczynski publishes, so it was inevitable that I would get to these particular Bookshots. 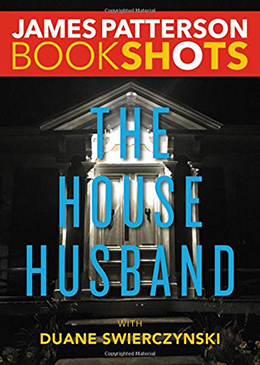 Let’s take a brief, closer look at both The Shut-in and The House Husband. The Shut-In was the less successful of the two experiences, but this is largely because we listened to the audio version of the tale rather than reading it. 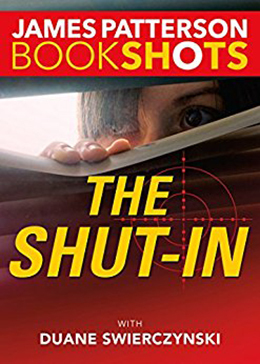 Because of a poorly thought-out casting decision with the audio narrator, much of the suspense and surprise of The Shut-In was lost. Readers experiencing the novella in written format are likely to enjoy this one, however, as the story was strong – just not right for audio format. The Shut-In is about Tricia Celano, a woman with a rare skin disease that prevents her from ever leaving the house during daylight hours. Her way of participating in the outside world is by launching a drone daily from her apartment window and spying on her neighbors and random citizens. When she witnesses a murder through her drone camera, this modern-day version of Rear Window is off and running. As one would expect from the bookshots format, there is not a lot of time for character development, but Swierczynski makes the most of his real estate by bringing Tricia and her secluded life alive for the reader. Add this to the clever use of modern technology in telling a timeless tale of murder and you have a recipe for an entertaining way to pass a few hours. I found The House Husband to be a much more satisfying experience. There is still little room for character development, but this serial killer story with a twist was original and fast-paced. It was certainly a new angle on domestic suspense and it would be interesting if Duane Swierczynski explored this sub-genre in greater depth in a full-scale novel. In The House Husband, Teagan Beaumont is a police officer who is struggling with the challenges of returning to work after having a baby. With her husband home taking care of the little one, Teagan feels out of sorts. But when a series of unusual deaths occur in her jurisdiction, the thrill of the hunt surges through her. Each of these cases involves the death of entire families – and the evidence is not adding up. Especially when the crimes hit closer to home than Teagan would like. Alternating with Teagan’s perspective are sections about Harry Posehn, a stay-at-home father who loves his family, but feels the need to escape each night for some “personal time” after stressful days at home. How these two come to clash is part of the mystery of this novella, so I will not spoil that here, but crime fiction aficionados will most certainly enjoy this one. Thanks for this! I’m intrigued by the Book Shots model and both of these titles are on my reading list. It’s an interesting model. And I will say, my Mom who is not much of a reader was in the car for this an really enjoyed the experience. So I do think they are reaching their intended audience – the casual reader, the non-reader, and the reader with limited time.